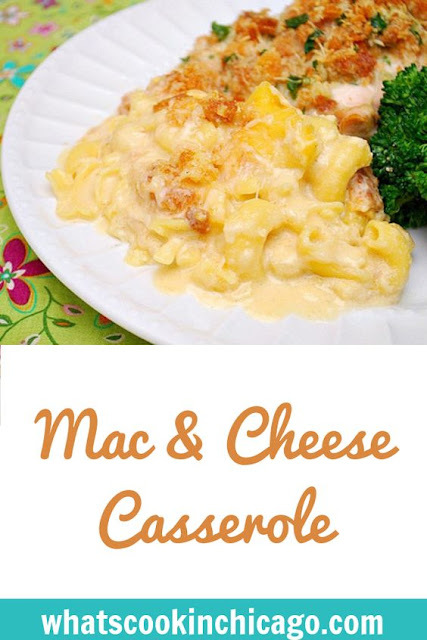 This is a little different from the traditional macaroni and cheese recipe in that there is a bit more cheese sauce to the pasta... making it a perfect dish if you love the cheese. I thought the ratio was perfect since I like a little more cheese than pasta. You can make this well in advance and even freeze it to enjoy later. 2. Cook the pasta according to the package directions for al dente. Drain and set aside. 3. In a large saucepan over medium heat, melt the butter. Whisk in the flour, then add the onion powder, garlic powder, salt and pepper. Gradually whisk in the milk. Cook, stirring constantly, until the sauce thickens and the mixture begins to boil. Add the cheese and stir until the cheese is melted. Add the cooked pasta and stir to coat the pasta. 4. Pour the mixture into a 9x13-inch baking dish. 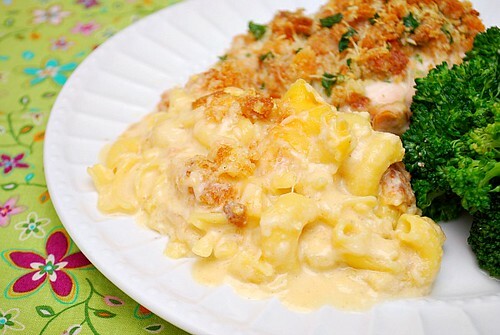 Mix together the bread crumbs, melted butter and parsley until all of the crumbs are moistened, and then sprinkle over the top of the pasta mixture. 5. Bake for 30 minutes, until golden and bubbly. Let stand 10 minutes and serve. I have been making lots of macaroni and cheese lately - such a comfort food.